December 21, 2017 By Denny Hansen & filed under All Articles, Rifles & Carbines, Weapons. Do we really need another AR-type rifle? Of course the answer is, absolutely yes! Different variations of America’s Rifle give consumers more options—and more options are always a good thing. Sturm, Ruger & Company’s new AR-556 Multi-Purpose Rifle (MPR) is a bit different than what is normally found on the market. No sights are included with Ruger AR-556 MPR. The Ruger AR-556 MPR was designed to fit into the sporting category (competition/target shooting) as well as the more common tactical genre, although it will perform well in either role. The milspec compatible upper and lower receivers are CNC machined from forgings and hard-coat anodized. No shortcuts were taken in the lower receiver. It is fitted with the Magpul® MOE® grip and MOE SL™ collapsible buttstock on the milspec lower receiver extension (buffer tube). The trigger is Ruger’s Elite 452 two-stage trigger. Advertised as having a 4.5-pound trigger, mine ran a bit on the heavier side, averaging 4.8 pounds. 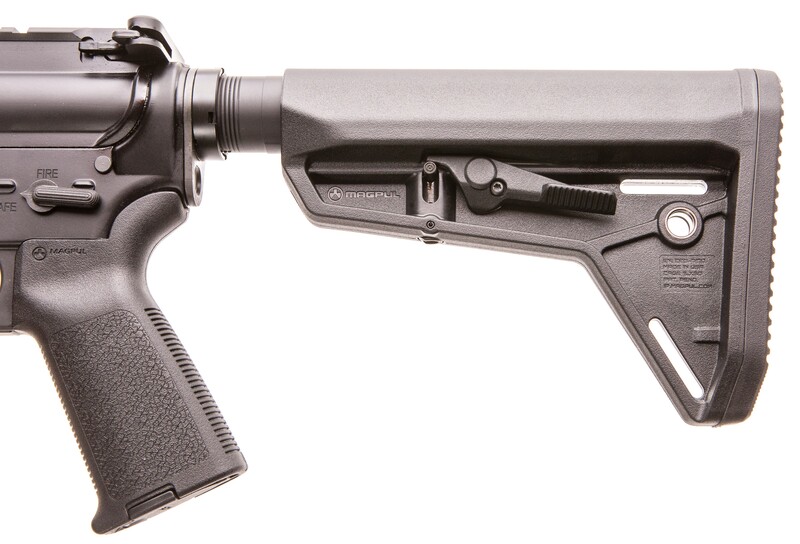 Magpul MOE SL™ collapsible buttstock is fitted on milspec receiver extension. The bolt carrier is chrome-plated on the inside diameter, as is the interior of the gas key, which is properly staked so it will not loosen. The exterior of the bolt carrier has a matte black oxide finish that provides corrosion resistance. The bolt itself is machined from 9310 alloy steel and is shot peened and pressure (proof) tested to ensure structural integrity and strength. 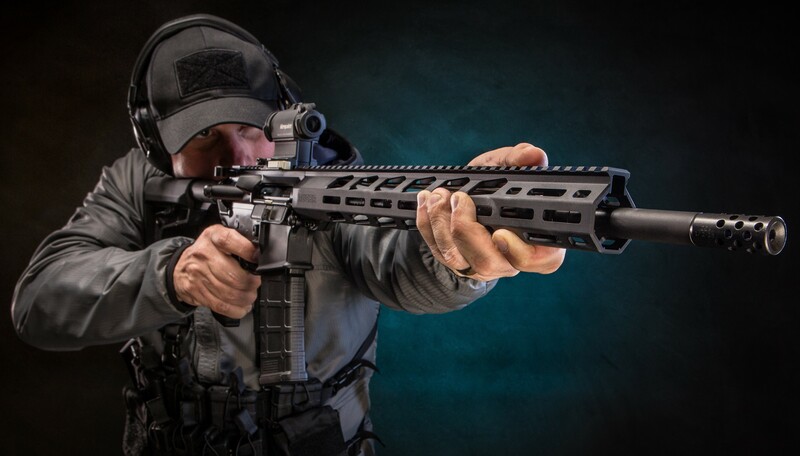 The MPR has an 18-inch, 1:8 twist cold-hammer-forged barrel that is contoured to minimize weight without sacrificing rigidity and has precise 5R rifling. The muzzle has the standard ½x28 thread pitch for attaching a muzzle device such as a suppressor or flash hider, and comes with a Ruger Compensator installed. The rifle uses a rifle-length gas system with a low-profile gas block. It is chambered in 5.56 NATO, allowing the use of both 5.56mm and .223. Ruger’s 15-inch free-float handguard is slimmer than many other quad-rail designs, measuring only 1.50 inches in diameter. 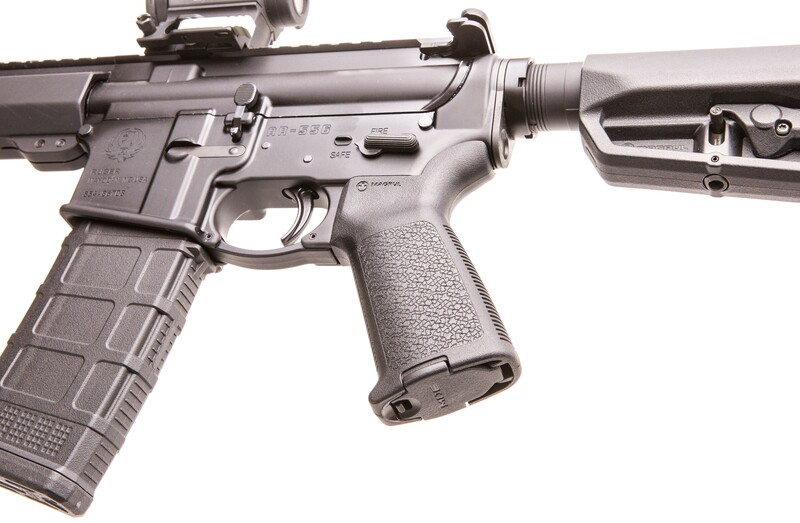 Handguard has Magpul M-LOK accessory attachment slots along 3:00, 6:00 and 9:00 positions. Additional slots near muzzle at 1:00 and 11:00 are well positioned for mounting a light or laser. 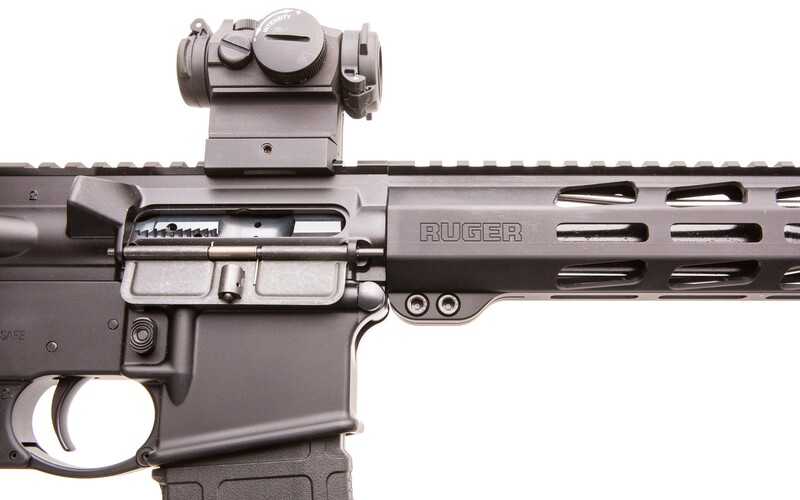 The barrel is covered with Ruger’s 15-inch free-float handguard and is slimmer than many other quad-rail designs, measuring only 1.50 inches in diameter. The handguard has Magpul M-LOK accessory attachment slots along the 3:00, 6:00, and 9:00 positions. Additional slots on each side near the muzzle at 1:00 and 11:00 are well positioned for mounting a light or laser. M-LOK-compatible Picatinny rail sections can be easily added. It would be nice to see Ruger include two or three, as the increased cost would be minimal. The integral Picatinny rail at the 12:00 position meets the most current STANAG 4649 specification. No sights are included with the rifle. The AR-556 MPR comes with a single 30-round PMAG, manual, and gun lock in a cardboard box with a fitted foam insert. Part of evaluation was conducted with Aimpoint Micro H-2 mounted on Ruger AR-556 MPR. When used as a “tactical” rifle, ARs are often set up with a red dot sight (RDS). I used an Aimpoint Micro H-2 for general shooting drills. With the mount, the Micro H-2 adds just five ounces of weight. With a battery life of 50,000 hours on the single CR 2032 battery it’s a good candidate for the standard operating practice of “turn it on, leave it on” for an RDS. It is available with either a two or four MOA dot. I have the two MOA dot, as I find it a bit more accurate at longer ranges. See-through flip-up covers are included to protect the lenses. Redfield Revolution/TAC 3-9X40 scope was attached to MPR using Leupold integral mount. To evaluate what kind of accuracy the AR-556 MPR is capable of, I mounted a Redfield Revolution/TAC 3-9X40 scope with the TAC MOA reticle using a Leupold integral mount. The TAC MOA reticle features stadia lines on the vertical and horizontal crosshairs set at two MOA increments, allowing a shooter to quickly compensate for bullet drop or wind. It can also be used to estimate range on objects of known size. Elevation and windage adjus™ents are in ¼ minute-of-angle (MOA) elevation and with tactile clicks for precision and repeatability. The Revolution/TAC has a one-inch tube, weighs 12.6 ounces, and is 12.3 inches long. It’s one of the few scopes I trust that don’t cost as much—or more—than the rifle I mount it on, though the one-inch tube does not transmit light as well as scopes with a larger diameter in failing light. Muzzle brake has a reverse crown. Standard barrel wrench fits flats on brake to change muzzle devices. I arrived at the range with 27 loads from nine manufacturers and one handload. Bullets weights ranged from 50 to 77 grains. Both 5.56x45mm NATO and .223 Remington loads were used. 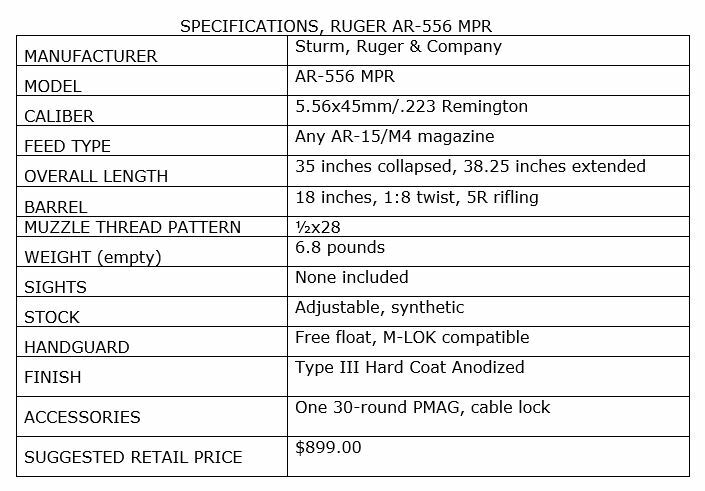 As mentioned earlier, the AR-556 MPR comes with one 30-round PMAG. And although the PMAG has arguably become the standard by which all AR magazines are judged, quite a few folks have magazines from other manufacturers they may want to use in the AR-556 MPR. I tested the rifle with a wide variety of magazines to gauge reliability. These included mags from Bravo Company Mfg, C Products Defense, FAB Defense, Fusil-USA, Lancer Systems, Magpul, SureFeed (OKAY Industries), TangoDown, and reconditioned GI mags. I ran a bore snake down the barrel and ensured the rifle was properly lubricated. No further cleaning or maintenance was done for the remainder of the evaluation. Pistol grip is superb Magpul® MOE® grip. I began by firing a ten-round string from each load over the sky screens of my PACT Professional Chronograph to establish the average velocity of each. Top velocity honors went to the Black Hills 50-grain TSX at a blistering 3,398.9 feet-per-second (fps). Often light bullets at a very high velocity won’t group extremely well, but the 50-grain TSX still shot into just over 2¼ inches at 100 yards. Something commonly read on the Internet is that a “substantial increase” in velocity is obtained with a longer barrel. In my firsthand experience, I have found the “increase” to usually be minimal. Using my handloads, I ran ten-round strings over the chronograph using a BCM® RECCE 14 with 14.5-inch barrel and a ROBAR PolymAR-15 with a 16-inch barrel to see how much difference there was compared to the AR-556 MPR’s 18-inch barrel. 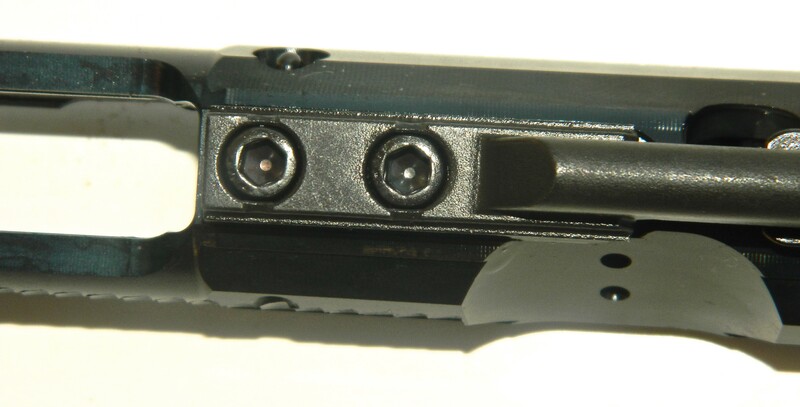 Handguard is attached with two Allen-head screws at rear of handguard. The MPR’s 18-inch barrel averaged a velocity of 2,684.1 fps, the Bravo Company’s 14.5-inch barrel averaged 2,609 fps, and ROBAR’s 16-inch barrel averaged 2,691.5 fps—actually higher than the MPR. An extreme spread of only 82.5 fps is not all that much when we’re talking about bullets exceeding Mach 2. It’s been my experience that if a new firearm is going to have any hiccups, it will usually be within the first 200 rounds, as any high points left in the manufacturing process are worn down and broken in. At this point, the rifle had 310 rounds through it with no malfunctions of any type. Next, I obtained a zero with the Redfield at 100 yards and settled in at my bench to see what the MPR was capable of. I fired two, five-round groups with the 27 factory loads. The results shown in the table are the average of the two groups. Gas key on bolt carrier is staked so it will not loosen during extended shooting. In all but a few cases, the AR-556 MPR showed a very strong preference for the heavier bullets, especially the 5.56 loads. 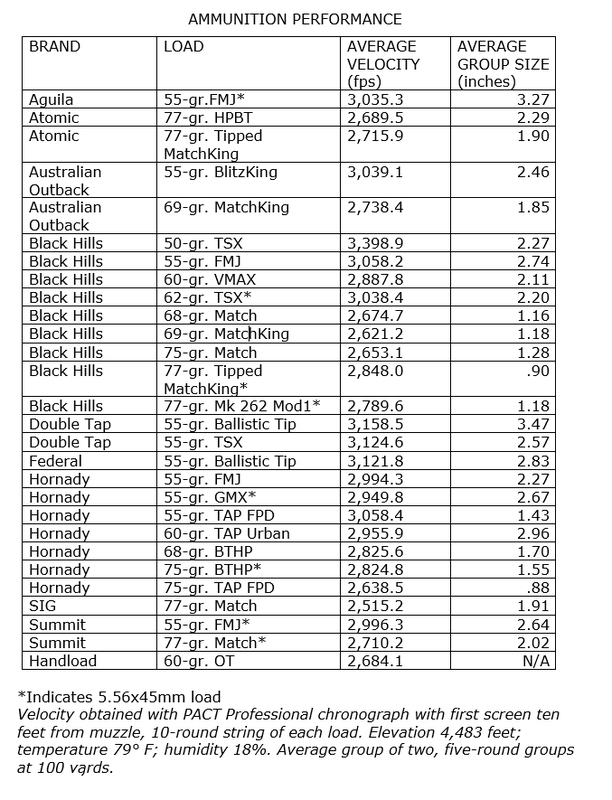 Top accuracy honors went to Hornady 75-grain TAP FPD at .88 inch, followed closely by Black Hills 77-grain Tipped MatchKing at .90 inch. I’ll take honest sub-MOA from a factory AR any day of the week! The remaining loads ranged from 1.16 to 3.47 inches, with the lighter bullets generally performing the worst. While the groups on the high side are nothing to brag about, all loads are capable of making the proverbial headshot at 100 yards. During this phase of the evaluation, I experienced four malfunctions when the bolt did not lock back when the last shot was fired. This occurred with a GI mag, a PMAG, a SureFeed, and a C Products Defense mag. I could not replicate the anomaly with the magazines using the same loads it occurred with. 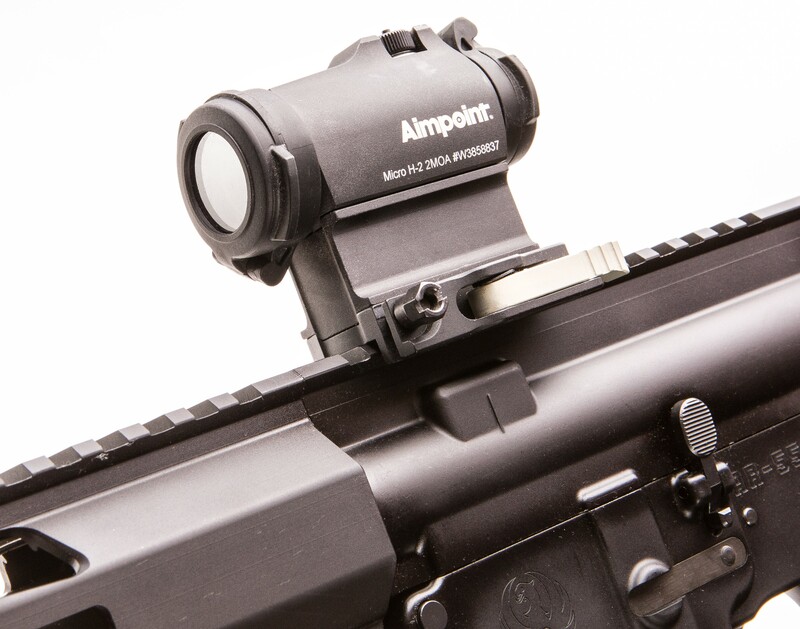 Weighing a mere five ounces and with a battery life of 50,000 hours, Aimpoint Micro-H-2 is an excellent choice for a red dot sight. I returned to the range the next day and zeroed the Aimpoint at 50 yards. I like the 50-yard zero, especially with an RDS, as it allows hits out to 200 yards with no need to hold over, and will only impact between one and two inches high at 100 yards. I incorporated movement in several standard carbine drills from 50 to five yards. The slightly longer-than-normal barrel was marginally slower coming up on target, but not enough to be of any real concern. I concluded with two full mag dumps as fast as I could press the trigger, using a PMAG D-60 and a SureFire MAG5-60 60-round magazines. This was followed by a ten-round slow-fire group. I wanted to see how much the point of impact would be affected with a very hot barrel, and if reliability would be influenced. Reliability remained stellar, but group sizes opened up a bit, with vertical stringing. Full-length integral Picatinny rail at 12:00 position meets latest STANAG 4649 specification. By the end of the evaluation, I had put just over 700 rounds through the rifle. The only malfunctions experienced were the above-mentioned four failures to lock the bolt to the rear after the last round was fired. 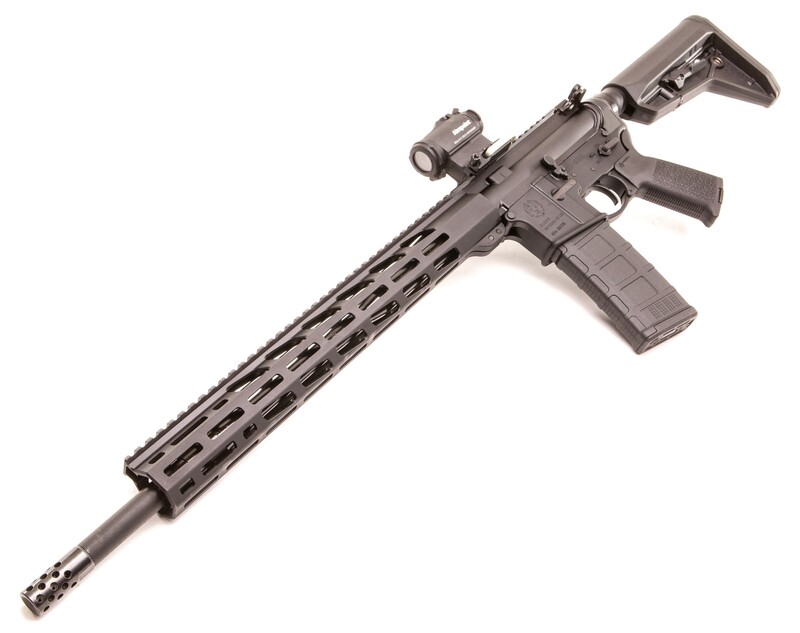 With a suggested retail price of $899.00, the AR-556 MPR is good value for a quality AR. Street price is likely to be in the $650 to $700 range, making it even more of a bargain. I found Ruger’s Multi-Purpose Rifle to be just that—a rifle that can perform well in many roles. STURM, RUGER & CO, LTD.